The Europeans enter this event not only with the expectations of having won four straight Ryder Cups on European soil, but also under the expectation that they have the best players this time around – not always the case at the Ryder Cup. Europeans took home three of the four majors this season plus the Players Championship and WGC-Bridgestone, and they have four of the six highest ranked players in the Official World Golf Ranking. There should be concerns about how top heavy the Euro team is, but in general most of their players are in form. In terms of betting odds, they’re trading at around 67% to win or tie to retain the Cup. McIlroy’s season was amazing. Coming off a disappointing 2013, Rory won two majors and two other important events, while also playing the best of any player in terms of my z-score rating since Tiger Woods in 2009. While his performance, like all mere mortals, fell short of peak Tiger Woods, he was still the best player tee to green in the world and rode a hot putting streak to his three straight victories in July and August. He’s the obvious best golfer in the world and will be relied on as the core of a pretty top heavy European team. McIlroy’s aggressive, birdie heavy game fits the four-ball format perfectly. He’s also paired with compatriot Graeme McDowell in all four of his foursomes matches (2.5/4 points) in his career. I expect that pairing will be relied upon again. I explained in the first part of this preview that Gleneagles sets-up well in foursomes for a mix of a long, aggressive player and a good iron player because of the distribution of the holes. Rory and G-Mac have a more or less perfect mix of talent to exploit that set-up. The Irishman put up perhaps the quietest elite season of anyone this year, finishing top ten in stroke play events seven times in the US, but only better than 7th once. Though short off the tee, G-Mac’s long had a very good tee to green game built around hitting fairways and greens; this year his putting surged from average to best on Tour. I’ve written extensively about how short-term putting regresses going forward, so don’t expect him to putt at an elite level. His best skill is hitting his wedges/irons. He’sone of five European players who are clearly superior to the rest of the team; it’ll be interesting to see how heavily those five (Stenson/Rose/Rory/G-Mac/Sergio) are relied upon in these matches. I expect he’ll play with Rory twice in foursomes and then play at least another four-ball match. Sergio’s returned to his top ten in the world standard for the last few years, but it feels like this year was the first time it was really acknowledged – probably thanks to his contending alongside Rory in several high profile tournaments. He finished top five at the Players, British Open, WGC-Bridgestone, and BMW, though he only won once this year in Qatar. Though commentators were quick to talk about his putting improvements recently, it’s been more important that he’s refined his normally fantastic tee to green game back into one of the best in the world. No one on Tour hit their irons better this year and Sergio also finished near the top in driving and short game. He’s most ideal in the foursomes format where his iron play and scrambling allow him to avoid bogeys better than anyone on Tour not named Jim Furyk. Sergio carries a 16-8-4 record into these matches and I expect he’ll be relied upon to play all five matches. His approach play and ability to play out of the rough (he’s one of the best on Tour) make a good foursomes partner for one of the longer, aggressive, even wild European players – Lee Westwood, Victor Dubuisson, or Jamie Donaldson come to mind. Stenson’s comeback from completely losing his game in 2010-11 has been well documented; he’s back to being one of the best golfers in the world now. Stenson’s a unique player, especially off the tee. He’s simultaneously extremely accurate while also out-hitting 75% of the Tour. That combination makes him one of the best drivers on Tour, but he also hits his irons well and is one of the most aggressive players on Tour in terms of going for the green in two on par 5s. He’s a great four-ball player, but also matches up well in foursomes with someone like Kaymer who is much better playing from the fairway than the rough and is also fairly aggressive. Rose is the last of the five elite Europeans who I would consider playing all five matches. After his break-through US Open win last year, he’s flown under the radar this year with only two world-wide victories. Nevertheless, he remains one of the truly elite players in the world. He’s another guy who relies on his fantastic tee to green game; his short game and iron play has always been great and he’s driving it really well this year. Rose’s putting has always been spotty, but it’s never been a liability. He’s another guy like Sergio who really hits out of the rough well. His all-around game makes him ideal for both formats; he’s probably the guy I’d play with Poulter in foursomes. Poulter is the most accomplished Ryder Cupper since the event expanded to include all Europeans in 1979. His record of 12 points in 15 matches blows away the rest of the competition, which is why he was selected despite a very down year to date. Poulter’s hung around at ~25th by my ratings over the last five years, but his recent stretch of awful play has pushed him more towards 40th. I don’t anticipate any of that will play into Captain Paul McGinley’s plans however; he’ll use Poulter extensively in both formats. Poulter’s tee to green game has never been that strong, but he’s an above-average putter and has a very good short game. That will give him an edge in foursomes, possibly with someone like Justin Rose who won’t be uncomfortable playing Poulter’s short drives and mediocre approach shots. Westwood’s been a Ryder Cup stalwart for Europe since his first matches in 1997, racking up 21 points in 37 matches and participating in every Cup during that period. Just three years ago he was one of the best in the world, but he’s slipped quickly – especially this season – to 33rd in my ratings right now. Even worse, his decline has been sharp in terms of tee to green play. At one point his long game was one of the best in the world, but his iron play has really slipped. Westwood is showing the tell-tale signs of losing his game due to agre: 1) his long game (approach shots/driving) has collapsed and 2) he’s over 40. 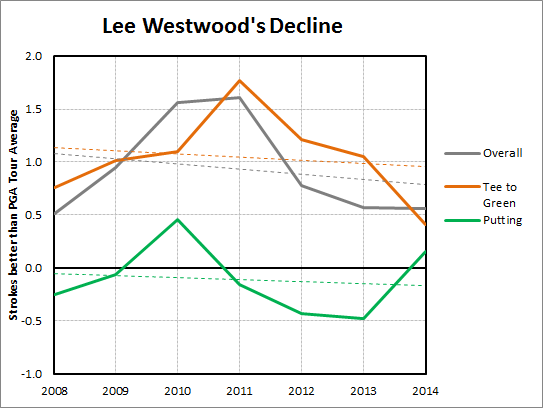 The reason he hasn’t slipped too much overall is that his putting has surged from poor to above-average after a career of poor putting, masking that tee to green decline. I’m not saying he’s going to fall off the Tour, but his days of contending for majors and being a Ryder Cup beast are likely over. Westwood’s driving remains solid and he’s aggressive in chasing birdies, so he’s ideal for four-ball play. Bjorn is one of two Euros left from the 1997 team that snuck past the Americans at Valderrama (Westwood is the other). Despite a solid career in Europe, Bjorn’s only returned to one further Ryder Cup team. He’s had a bit of a renaissance entering his 40s, but at 44 the end is near. He’s poor off the tee and not impressive with his irons, but is a good putter. Overall his he’s probably the second worst Euro and is best utilized for maybe one foursomes match, but that’s it. Even if there’s a penalty for playing all five matches, Bjorn is so far inferior to the five elite guys that I’d leave him on the bench. Kaymer’s reputation is probably the most inflated beyond his abilities of anyone in the world thanks to his victories in the Players Championship and US Open and prior #1 in the world ranking in 2011. 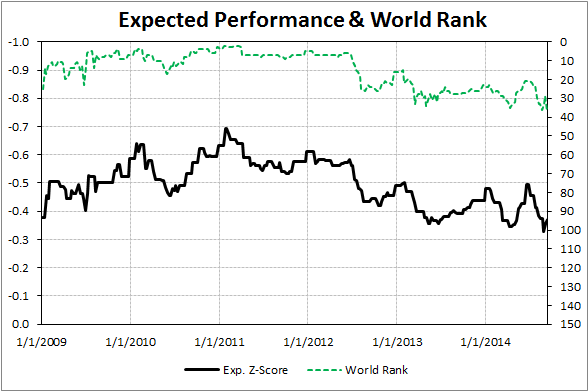 Unfortunately, Kaymer hasn’t played anything like he did in 2009-11 (consistently top ten in the world by my ratings) in 2012-14 (outside the top 20 since early 2013 by my ratings). His winning performances at the Players and US Open were obviously his best performances, but he’s been incredibly inconsistent – finishing with performances below PGA Tour average in nine of 22 tournaments this year. That’s just not indicative of an elite player. Kaymer’s strong suit is his aggressive style. He makes a ton of birdies and goes for par 5s in two consistently, but he’s more prone than most to bogeys. He’s clearly best suited to play four-balls, though, as I said above, he’d be a good foursomes partner for Henrik Stenson. Dubuisson – at only 24 – is one of Europe’s main hopes for the future as they phase out the Poulter/Stenson/Westwood/Donald generation over the next few Cups. He’s been solidly inside the top 100 in the world for a few years, but really emerged last fall with a win and a 3rd place in the final two Race to Dubai playoff events. PGA Tour fans saw him in action in Match Play in February where he famously got up and down from cacti on consecutive holes to continue his finals match with Jason Day. More impressive were his major top-tens at the Open Championship and PGA Championship. Dubuisson’s game is built on his driving distance (he’s 6th on the European Tour in distance and top 20 among PGA Tour players with at least nine tournaments played). Despite his highlights, his short game hasn’t been better than average, and his putting has been very poor this season – easily the worst of anyone in this event. He’s perfect for the four-ball matches because he’ll be able to bomb it with impunity, ideally partnered with someone like Rose or Sergio who consistently keeps it in play. Donaldson’s one of those European players who plays great golf and contends regularly, but is relatively anonymous to PGA Tour fans who only see them if they contend at a major or WGC. Donaldson’s been consistently good for the last 3-4 seasons and has been very hot lately – win & two top-tens in the past month.. He has a good tee to green game and could really surprise people with his performance this week. I’d fit him alongside Sergio in foursomes, but he’d be fine in four-ball as well. Gallacher was a pretty terrible captains pick. Not only is he inferior to Luke Donald (10.5 points in 15 career matches) and Francesco Molinari in overall ability, Gallacher is a rookie who is riding an outlier year of hot putting. This is by a significant margin the best he’s ever putted in recent seasons and it just so happens that this is the best he’s played in recent seasons. I expect once his luck with the putter runs out he’ll be back to being an average player. The Euros have to hope that doesn’t happen this week. I expect they’ll regret not bringing Luke Donald who, while seriously out of form, still turned in an equal season to Gallacher and at least would be a strong asset in foursomes with his putting and short game brilliance. I’d bench Gallacher for all four rounds and hope he runs hot in his singles match. Do the levels of shading indicate above and below average? I assume green is good and red is bad, but Westwood and Kaymer’s 17% bogey% is darker than the 17% bogey % of Poulter and Gallacher. Yeah it’s however excel’s conditional formatting spit it out. 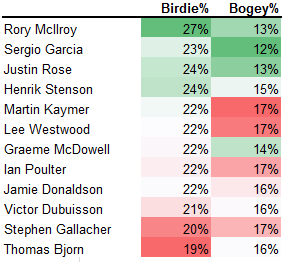 Guessing that Westwood and Kaymer were more like 17.4% and Poults was 16.6% or so.